Approximately 80 minutes by ferry from Unten Port in Nakijin Village and located 23 kilometers northwest of Cape Hedo, Iheya Island is Okinawa’s northernmost territory. Iheya is 14 kilometers long but only three kilometers wide at its broadest point, and with about 80 percent of the land dominated by a 200-meter-high mountain range it doesn’t have much in the way of commercial tourist facilities compared with other islands. But this, conversely, is its attraction: untouched, pristine nature. 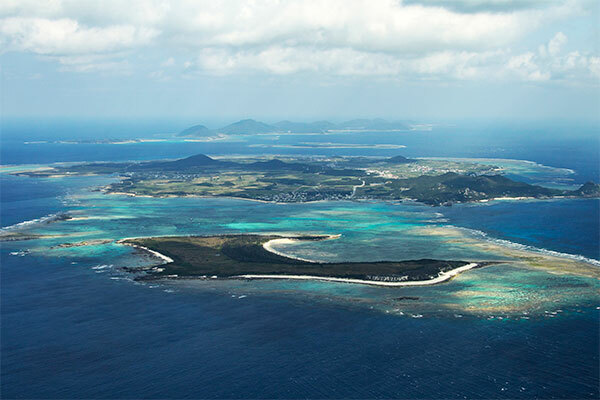 With many large sand dunes, emerald green seas and endless white sand beaches, this truly is a beautiful island. Water transparency levels are at their best between January and March when you can see to a stunning depth of around 50 meters. Even when transparency is at its worst between July and September, you can still see as deep as 30 meters, making this a popular snorkeling and diving destination. With a giant three-kilometer table of coral reef, a one-kilometer stretch of crimson isobana and schools of vividly colored migratory fish, there is plenty to see down there. In the spring you can often see pilot whales and dolphins in the waters around Iheya as they hunt for squid and fish. And because it is not a major tourist spot, Iheya’s coral reefs are kept stunningly immaculate. During winter and spring five-meter-long humpback whales swimming leisurely in pods of three or four can be observed just a few minutes from Iheya’s fishing port. Fifteen minutes to the east, and you can see schools of dolphins. 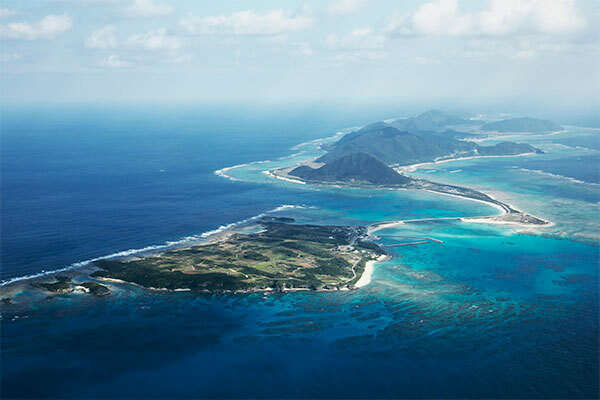 With a population of just 1,400 people, this unspoiled island is blessed with bountiful oceans and mountains. iheya_island_mapThere are many excellent diving spots off Iheya’s north coast. Between spring and autumn you can see schools of migratory fish, while from winter through summer green sea turtles abound to entertain divers. A traditional Okinawan townscape can still be found in Izena Village. Approximately an hour by ferry from Unten Port in Nakijin Village, Izena is located about 30 kilometers northwest of the main island of Okinawa and has a circumference of 16.7 kilometers. Izena is surrounded by coral reefs and white sand beaches and is rich in Ryukyu pine trees. The streets in the villages are lined with fukugi trees, and the local houses are surrounded by stone walls and adorned with red tile roofs. Izena has a number of cultural assets and is widely known as the birthplace of King Sho En, the founder of the Second Sho Dynasty of the Ryukyu Kingdom. To get around the island, renting a motorbike is recommended as it has quite a hilly landscape. Izena is also known for its total lack of habu, the poisonous snake commonly found in Okinawa. King Sho En was born in 1415 on the agricultural island of Izena. 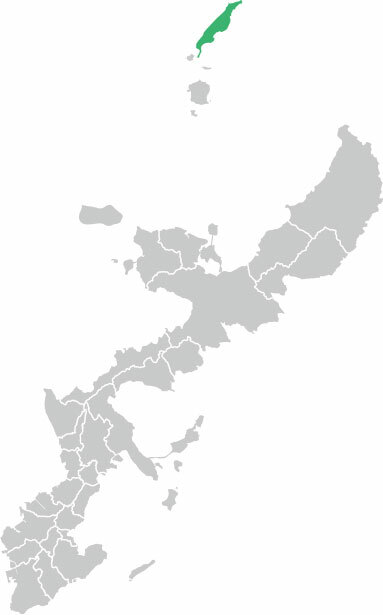 Back then, Okinawa comprised three kingdoms: the Hokuzan (Northern Mountain) Kingdom, the Chuzan (Central Mountain) Kingdom and the Nanzan (Southern Mountain) Kingdom. The kingdoms would often struggle for power and dominance over the entire island. At the age of 24, the future King Sho En, known then as Kanamaru, traveled to Shuri, the capital of the Ryukyu Kingdom, and settled there. He rose in rank from a retainer of the prince to royal treasurer. He gradually increased his power and finally ascended the throne as king of Ryukyu at the age of 55. A number of cultural assets related to King Sho En such as the King Sho En Garden Park and the Tamaudun Mausoleum can be found on this island. They are both very appealing destinations for those visiting Izena. Izena possesses a pristine natural landscape, beautiful coral reefs, white sand beaches and dense forests that are still untouched as the island has not yet become a major tourist attraction. The population of Izena is approximately 1,500.